M.T.O. Shahmaghsoudi® was originally called M.T.O. which stood for Maktab Tarighat Oveyssi®. This literally translates into 'The school of the way of Oveyss'. 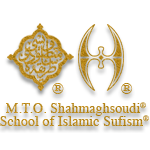 However, after the tireless dedication shown by the previous Master, Hazrat Shah Maghsoud Sadegh Angha, the 41st Sufi Master of the School, the doors of Sufism: the reality of Religion, were open to students around the world like never before and the school then became known as Maktab Tarighat Oveyssi Shahmaghsoudi®. Hazrat Oveyss Gharani lived in Yemen and was a student of the Holy Prophet. However, he never physically met the Prophet Mohammad (peace be upon him) but was able to cognise the teaching through a heart to heart connection with Him and this was later confirmed by his Holiness. Salman Farsi was a Zoroastrian who later converted into Christianity after searching the land for the meaning of life. He eventually discovered what he was looking for after he met the Holy Prophet (peace be upon him) and as a result became a Muslim. Salman Farsi represents the outward search for knowledge as he physically set on a journey to discover his true self. Hazrat Oveyss Gharani and Salman Farsi both learned and finished inward and outward cognition with Amir Al Momenin but their paths were different.